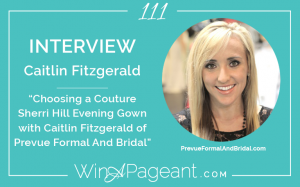 In this episode, Alycia Darby interviews Caitlin Fitzgerald of PreVue Formal and Bridal. PreVue Formal and Bridal has been dressing our pageant and prom customers in THE BEST for over 32 years! Pageant Planet voted them #1 prom store in the country for the 2016-2017 season due to their selection of 16,000 formal gowns, their exclusive dress policy, and their ability to help you find the perfect dress for your occasion. Prevue carries one of the largest selections of Sherri Hill Couture gowns and are a top retailer for Sherri Hill, Jovani, Faviana, La Femme, Scala, and many more of the top formal wear brands.